I am excited that it’s time for Week In Review. Having taken Meghan’s advise, I have been making those lists that she loves so much and I’m starting to get a handle on things. Be sure to stop over at her blog, Clean Eats, Fast Feets when you’re finished here to see what everyone else has accomplished. This is my new day planner all listed up. 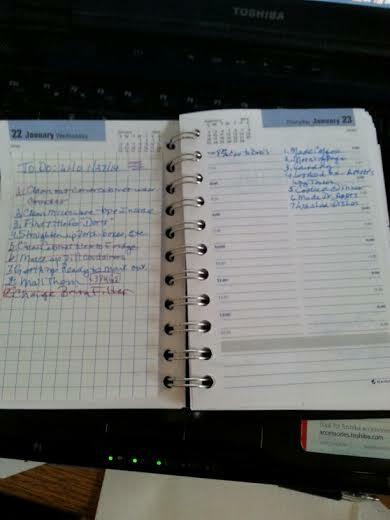 I had a different type of planner, but it didn’t work for me. This type has always been my favorite, giving me a full-page for each day. I thought I was going to have to order it, but I walked into a local stationery store and there it was…On Sale! Ok with me! The front is covered in dragonfly stickers because…well, I Like dragonflies! Maybe I’ll show you next week! On the day itself, I list what I do so that I can actually acknowledge that I have accomplished things. On the left, I found a large graphed Post-It that I use for my things to do for the week. Each thing gets checked off as I do it. Whatever I don’t finish that week will be transferred to a new Post-It for the next week. I’m feeling great about this plan and I think I’m feeling better about getting things done. So in Meghan style…Here it comes! ~I did four blog posts this week! I’m very excited about that because I have been lacking enthusiasm and focus with the blog. I’m feeling much more back on track with it now. ~I wrote my morning pages for the Artist’s Way every day. I also accomplished my Artist’s Date. I went to Michael’s craft store. This doesn’t mean much to anyone who doesn’t know about the Artist’s Way but this is great. If you don’t know about the Artist’s Way and you are a writer, artist or any type of creative person. Give it a try. It’s great! ~Cleaned out two kitchen cabinets. Ear-marked a Lot of things to go to the thrift store. I don’t need them anymore! ~Organized things to go to the thrift store. More to be done here and I can’t wait for the weather to clear up so I can actually accomplish getting to the thrift store. I don’t want to slip and fall trying to get rid of this stuff. From the weather report, doesn’t sound like I’ll be doing it this week. Guess I’ll just have to work at adding to my pile! ~Cooked beans in the crock pot twice to help keep myself on track. Crock pots are the best. I think I’ll be making more soup in there in the coming week. I am the Crock pot Queen! ~Spent Saturday afternoon with Ralph’s sister Maddie and her husband George, his niece Marie, her husband Paul and the ever adorable Jesse and Trevor. We had such a good time. Perfect finish to the week. So how’s that for really getting into the List Life?! I’m liking this. I’m feeling good about the whole process. Perhaps I can end up being Meghan when I grow up! Don’t forget to check out the other reviewers over at Clean Eats, Fast Feets. Happy Monday! Now…Go Make a List!! This entry was posted in Uncategorized and tagged crock pot, Lists, sorting and packing, Week In Review. Bookmark the permalink. Haha love your planner- I’m so the same way. Have a great Monday! Great job Fran. 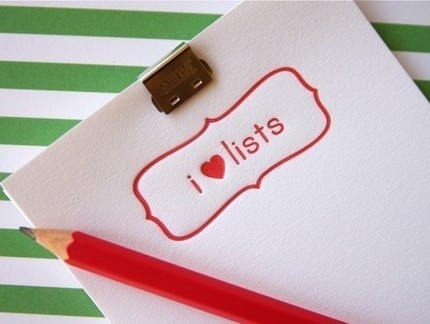 I think lists might just be your new color. Look at how accomplished you were, and more importantly, look at how pleased you are with yourself, and of course, you should be. That alone makes it worthwhile. I may have to start calling you #vanillagorilla. Thanks, Meghan! I’m feeling pretty excited about things. Amazing how things can turn around. Some great things came up at my Artist’s Way meeting last night. I’m feeling motivated in a Lot of ways!